With over thirty-five years of higher education experience, Richard Cook has devoted his entire professional career to the independent college sector. After sixteen years of service as a chemistry professor, division chair, and faculty leader, Dr. Cook became provost of Kalamazoo College (MI) in 1989. 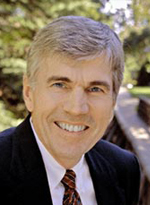 He was named president of Allegheny College (PA) in 1996, presiding over significant growth in enrollment, program innovation, and national institutional recognition. He served successfully in that capacity for twelve years prior to stepping down to pursue independent consulting and environmental advocacy. Dr. Cook is an honors graduate of the University of Michigan and holds a Ph.D. from Princeton University. He was conferred an honorary doctorate and the title president emeritus by Allegheny College and is the recipient of numerous other awards and recognitions in education and civic service. He is currently a principal of Lahti Search Consultants and is an inaugural 2009-10 Senior Fellow of Second Nature, Inc.
Dr. Cook's professional experience includes leadership roles in the Great Lakes Colleges Association, Council of Independent Colleges, Annapolis Group, North Coast Athletic Conference, Bonner Foundation, and other organizations and initiatives. He is well known and respected nationally within the independent higher education community in a wide variety of contexts, including civic engagement, campus sustainability, international study, undergraduate research, enrollment management, and institutional positioning. He has visited numerous campuses nationally and internationally in a variety of capacities, including administrative and academic review, program development, accreditation, and sustainability. Long engaged in the combination of environmental science and policy, Dr. Cook held gubernatorial appointments to the Michigan Toxic Substance Control Commission and the Environmental Science Advisory Board of the State of Michigan. He was an independent reviewer of technical studies in connection with the Love Canal Hazardous Waste Site in Niagara Falls, a case that led to the adoption of the Federal Superfund Act. Cook has traveled extensively domestically and internationally, consulting on issues of hazardous and municipal waste.